Pinnacle™ and Pinnacle Plus™ reverse osmosis filters work on a basis of pressure against the reverse osmosis membrane. The higher the pressure, the better the unit will remove impurities. Pressure should be maintained while the filter system is running at between 40-60 PSI per the attached meter on the membrane housing. This is normal for most household and municipality water pressure. If the pressure to the unit is below 40 PSI a booster pump may be required. If the pressure is below 60 psi the automatic shut off valve may not function properly. Consult your local dealer. Pinnacle™ or Pinnacle Plus™ reverse osmosis filters work well between 77° and 113° Fahrenheit (25°–45° Celsius). Reverse osmosis membranes work best using colder water. The colder the source water is the higher the pressure and the lower the flow will be through the reverse osmosis membrane. As such, more impurities or Total Dissolved Solid (TDS) are removed from the source water. The higher the temperature of the source water is the lower the pressure and higher the flow will be through the reverse osmosis membrane. As such, more impurities are able to pass through the filter. The difference is minimal in any case but worthwhile noting. Problem: 1) Water keeps coming out of the waste water line (black tube) even though the output line (blue tube with ball valve on the end) has been closed off. 2) The filter makes a rattling or “hammering” noise, perhaps sporadically, and the pressure seems to go up and down on the pressure gauge. How the automatic shut-off valve works: When the output line (blue tube with ball valve on the end) is closed, backpressure builds up in the filter system. When the backpressure gets to a certain point, the automatic shut-off valve cuts off the supply of water to the membrane. Since the supply to the membrane is cut off, the wastewater (black tube) will stop running. This requires that there be at least 65 PSI on the feed line to the reverse osmosis filter and that there be an absolute shut-off of flow at the end of the product water line (blue tube). Solution: 1) Insufficient pressure on the feed to the filter will not produce enough backpressure to activate the automatic shut-off valve. Low water pressure may be corrected by two methods: (a) by consulting a qualified plumber to adjust water pressure entering your home, or (b) purchasing a booster pump (available from Seachem’s Pinnacle™ line) to increase water pressure in your Pinnacle™ or Pinnacle Plus™ reverse osmosis filter. Contact your local dealer for further information. 2) An absolute shut-off of flow is required to activate the automatic shut-off valve. Many float valves used in the aquarium hobby do not provide an absolute shut-off of flow and will cause the automatic shut-off valve to make a rattle or “hammering” noise and the pressure gauge to have a wildly varying reading. An electronic float switch and solenoid valve or a pressurized storage container is the best solution in such cases. 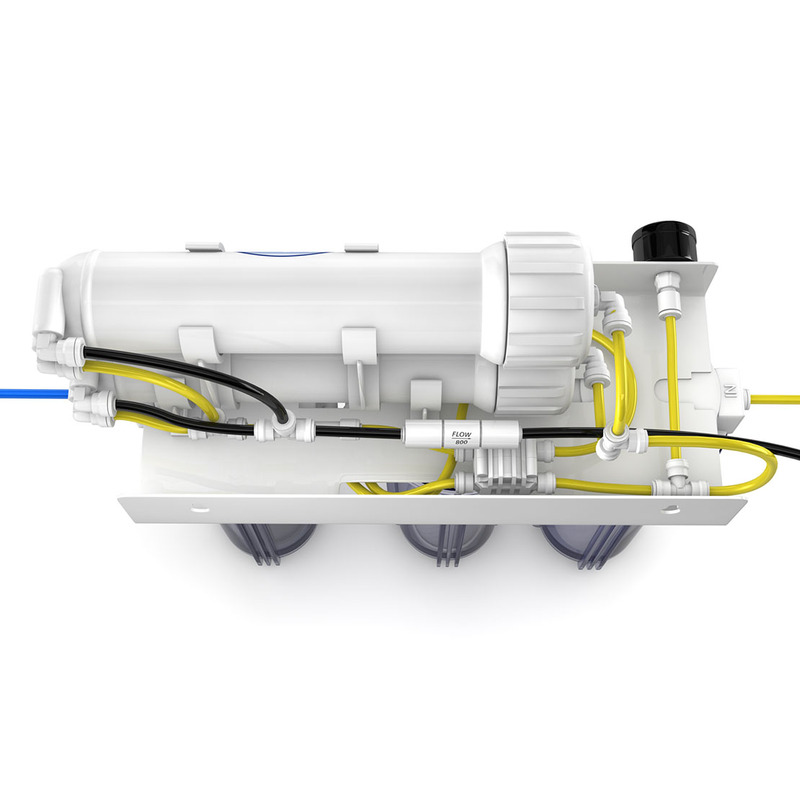 Seachem™ offers a float switch and solenoid valve that provides an absolute shut-off to the product water line (blue tube) in place of insufficient float valves. Contact your local dealer for further information. 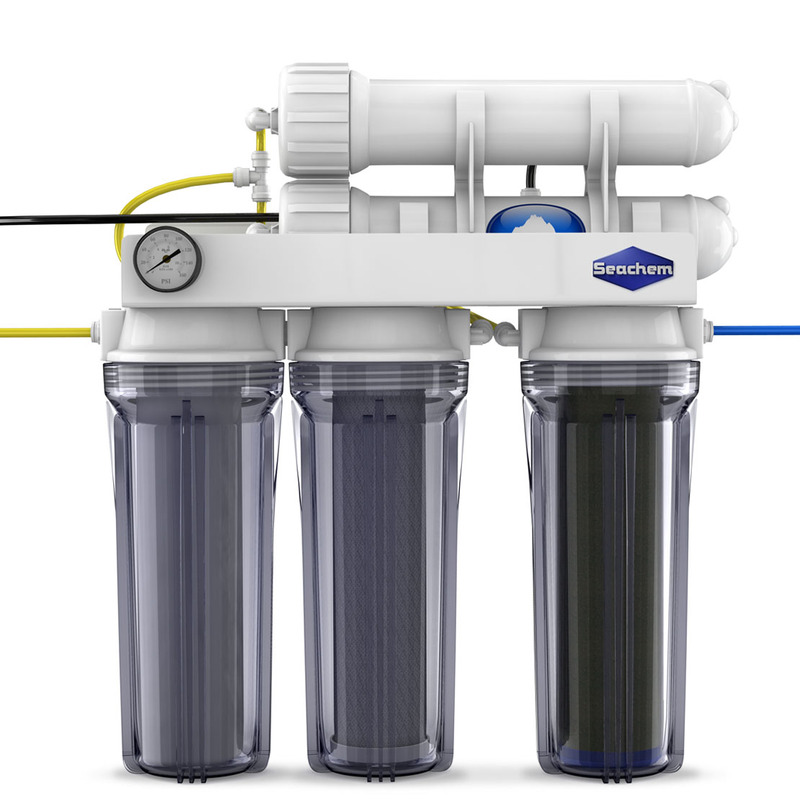 3) If you have connected a pressurized storage container to your Pinnacle™ or Pinnacle Plus™ reverse osmosis filter, the water may run from the waste water line (black tube) for a while after you have closed the output line (blue tube with ball valve on the end). This is an effect of the filtration system topping off the storage tank. When the storage tank is full the waste water line (black tube) will stop running. Note that the R/O will still function well in producing excellent quality water even though the automatic shut-off valve may not be working or may be producing a noise. Problem: The filter system seems to produce a significantly larger amount of wastewater than it did when it was new. 2) The wastewater seems to come out with more force than it did when the filter system was new. Solution: The reverse osmosis membrane may be clogged or fouled. A test with a TDS meter is the best means to confirm this. Otherwise consult the previous section, “Membrane & Filter Cartridge Replacement Schedule”. 2) Though not common, the flow restrictor may have failed. Contact your local dealer and inform them of the EXACT model of Pinnacle™ or Pinnacle Plus™ filter system you have. Flow restrictors are different based on the US Gallons Per Day (GPD) rating of the filter system. Your local dealer can assist you in getting a replacement of the correct flow restrictor for your model. Problem: I’m not getting the rated capacity out of the unit, what could be wrong? Solution: There are many variables that can affect output capacity: temperature of source water, low water pressure, clogged sediment or carbon cartridge(s), and exhausted membranes. Low water pressure may be corrected by two methods: (1) by consulting a qualified plumber to adjust water pressure entering your home, or (2) purchasing a booster pump (available from Seachem’s Pinnacle™ line) to increase water pressure in your Pinnacle™ or Pinnacle Plus™ reverse osmosis filter. Please consult your local dealer for booster pump options, filter accessories, replacement sediment and carbon cartridges, and reverse osmosis membranes.